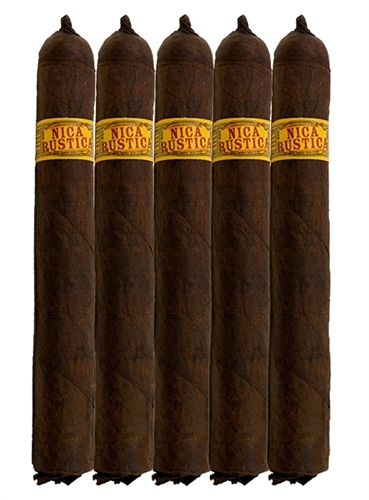 Nica Rustica El Brujito is a cigar made by Drew Estate that is aptly named and fully delivers. It's a rustic Nicaraguan cigar named after El Brujito, who is a shaman or, more literally, "witch doctor", stretching back to pre-Columbian times. This cigar looks like it tastes: authentic, without frills, and only focused on the genuine quality of tobacco. The head is finished with a straight twisted cap and the foot has the uncut wrapper gathered over the end of the filler. This cigar offers up a truly authentic profile of the soil and sun of Nicaragua from the Esteli and Jalapa filler tobaccos, the structure of the San Andres binder from Mexico, and the appropriately rustic-looking Connecticut Broadleaf wrapper that offers up a rich depth to marry this blend together. Medium in body and full in flavor, this is an approachable blend that will keep you coming back to uncover the rest of the secret powers that this blend embodies.